Mango Kadhi is a feast for your senses! 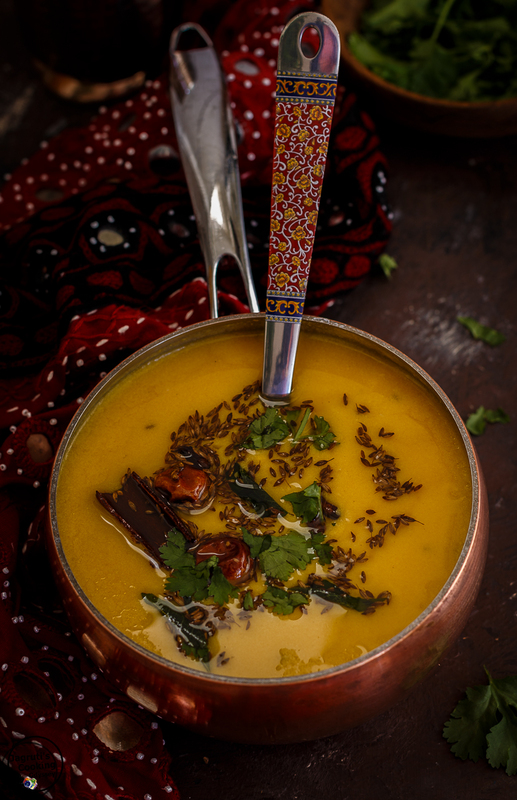 It is a delicious and lip-smacking summer delight, Gujarati style Mango Soup, This is one of the Kadhi varieties prepared with yogurt , chickpea flour (besan) and tempered with ghee and aromatic spices. The preparations that go into making the Mango kadhi are same as making the Gujarati traditional kadhi but the sweet mango pulp brings to the kadhi another unique flavour. This aromatic and tasty kadhi pairs beautifully with Coconut and Almond Rice, Green Peas and Mint Rice. 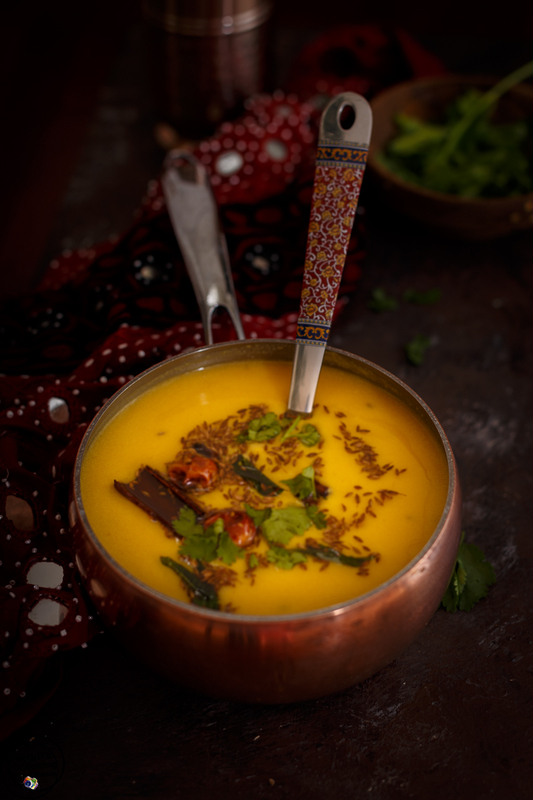 Some are mistaken in thinking that Mango Kadhi itself is Fajeto which is another famous Gujarati authentic summer recipe prepared with Mango Pulp. There is a major taste difference in these two recipes. If you love something which is slightly sweet, sour and little spicy then you must prepare this dangerously addictive Mango kadhi, it's a killer! 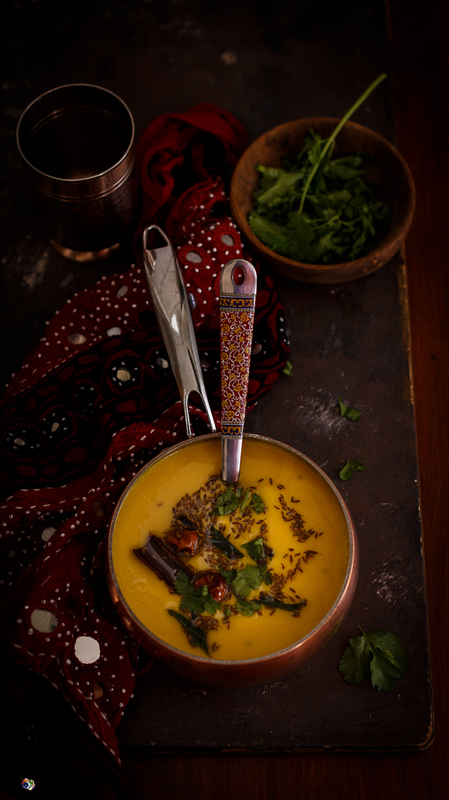 Gujarati Mango kadhi is a summer delight. This Kadhi is prepared with ripe mango pulp, yogurt and besan. It can be ready in 20 minutes. In a big pan combine chickpea flour, yogurt and beat till it's smooth and silky.Add 2 cup water and mix again.Add salt, turmeric, ginger-chilli paste and mix once again.Simmer the kadhi mixture about 10-15 minutes on a low heat.In a very small pan heat ghee and add cumin seeds, cinnamon and cloves. Once it splutters add dry red chilli, curry leaves and hing.Pour it on the kadhi mixture.Turn the heat off and add mango pulp.Gently mix and cook another minute or so.Serve hot in Gujarati Thali with rice.enjoy! This mango soup looks so good. I love the way you styled it in your pictures :-). This mango soup is so colorful and luscious looking - totally a must-try! YUM! Mmmm. I've never heard of this soup. It looks so delicious! It's sweet you made it for your daughter! You're a good mom! :) You have beautiful photos!! I would definitely love this soup! I adore mango and other ingredients sound just as good! This soup looks very tasty. I would love to try it. That sounds absolutely amazing! Deliciously fruity with a hint of spice. Perfect for summer! OOOH this sounds and looks delicious. I love your photography too. Just got some fresh Mangoes from the nearby Indian store! Time to try this recipe :) and hope it turns out as good as I am expecting it to be! I have an obsession with how different cultures are. I love to see what other eat and how they live. This is a very interesting recipe, I have never tried mango in a kadhi so intrigued to try it. That looks so yum! I wish I have seen this a little early in summer when mangoes were available. I have tasted this, sometime back i Baroda. I like the tangy flavor of it. I just love your food styling ! Looks amazing and a lot to learn from your page :) Mango kadhi looks absolutely delicious and can feel the taste of it.. yum ! That is gorgeous. Never can resist your recipes.